Middlebury College's U.S. Department of Energy Solar Decathlon 2011 entry, Self-Reliance, is permanently located on its campus in Vermont, where it continues to fulfill its educational mission. Students and visiting faculty can experience 100% solar-powered living by spending a semester or summer in the house. Although Self-Reliance is smaller than today's average American home—just 990 ft2—residents enjoy the efficiently designed space, learn about their energy-consumption habits from the energy-monitoring dashboard system, grow their own vegetables in the greenhouse wall, and benefit from living in a home made from durable, natural, local materials. 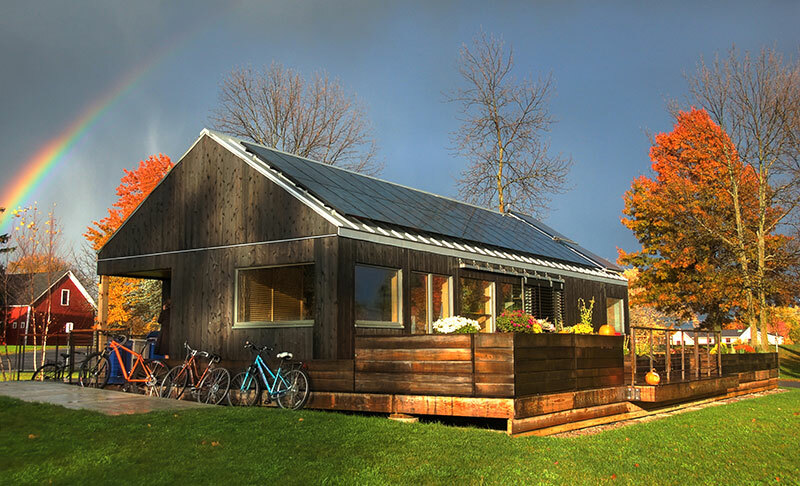 By incorporating the best features of the New England farmhouse into a novel design for the 21st century, Self-Reliance won fourth place in the Solar Decathlon 2011 competition and earned first-place finishes in the Market Appeal, Communications, and Home Entertainment contests. To schedule a tour, contact: self-reliance@middlebury.edu.